“Wait a minute!” I exclaimed as she was preparing her backpack to leave. Sophie looked at me like I had lost my marbles. “I think I know where you can find more information.” I scanned the bookshelves in our living room. Not there. I paused for a couple of seconds, perplexed. “Where are they?” I wondered out loud. “Mom, what are you doing?” Sophie asked, intrigued by my sudden burst of energy. Mind you, what I was looking for wasn’t a small object. There was no way it could get lost in our house. “I know where it is,” I said out loud as I entered the TV room. I found my quarry and got down on my knees, as if in prayer. I asked Sophie to join me. “This is the World Book Encyclopedia,” I announced with a mixture of glee and solemnity, flashing back more than 30 years to a vision of my pre-teen self turning the pages to find an entry on the Vesuvius-destroyed town of Herculaneum for a middle school project. The 22 tomes sitting in front of Sophie and me were not the same tomes of my youth. My cousin, who used to work for a huge public library, gave us the amazing gift of a complete set a few years ago after her branch received a newer edition. It was pristine, having barely been touched in the Age of Google. Although Chloe and I have used it a few times, Sophie hadn’t been aware of its existence until the other morning. 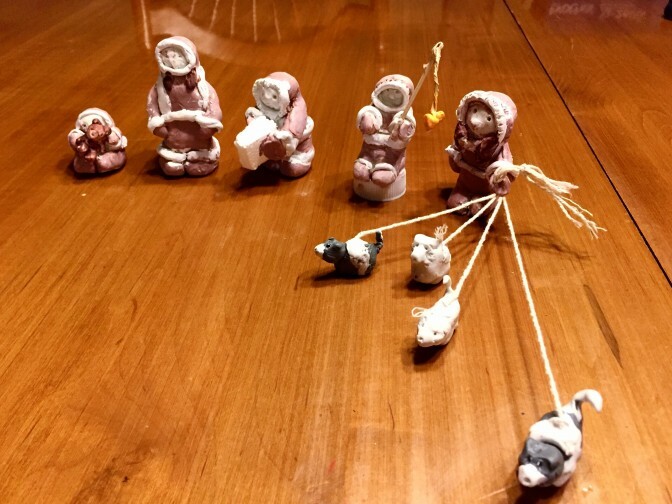 I quickly explained how to find the entry about the Inuits and she set to work, first locating the correct volume and then finding the page. After Sophie left for school, I had an unsettling epiphany. In the couple of years since Sophie has had projects requiring research, I had never once, until the other day, suggested she consult our encyclopedia. A 3D model of the solar system, a poster about Asian elephants, a brochure about the state of North Carolina, a report on the climate of Sweden…each and every time, the volumes sat on the shelf, unused and unloved, like Don Freeman’s Corduroy, while we Googled and Googled some more. During the summer of 2014, my family took a vacation to the Grand Canyon and Utah national parks. For the length of our road trip, an AAA map was glued to my hand. There’s something incredibly satisfying about seeing thousands of miles laid out on your lap and tracing great distances with your fingers. As convenient as GPS is, it’s not magical in the same way. Using it feels lazy. I reflected on the similarities between map-reading and encyclopedia-consulting as I thumbed through the World Book again this morning, randomly flipping to impala, Indiana (did you know the Raggedy Ann doll was created in Indianapolis? ), Indochina, inis (the Irish word for island), Inverness, and isthmus. I was mesmerized by the all the words and pictures and knowledge squeezed between the covers, and I couldn’t believe that in all these years, with such a great resource right on our shelves, I hadn’t sent Chloe and Sophie to the World Book volumes first, as a matter of course. We’re at an inflection point when it comes to books. I was heartened to read recently that sales of e-books have started to decline, while print has shown more resilience than many experts thought possible only a couple of short years ago. I am glad for that. I don’t think there’s anything wrong with having to toil a little bit before finding what we’re looking for. It makes reaching our destinations so much more exciting, don’t you think? Do you have a set of encyclopedias in your home? And have you inadvertently neglected them, too? A good day to ya! Thanks for stopping by – I was truly appalled by my neglectful ways. But am glad another year didn’t go by before I remembered we have such a great resource right in our own house! But you did. You did get the books out. That’s all that matters. Also, you wrote this post. All good. 🙂 You’re right. I’ll grab my phone to look something up (just today “What is tannin? How does it turn leaves brown if it’s not a pigment?”) so I feel your pain. Thanks, Sarah for your encouragement, as always. I really liked your chlorophyll musings today, by the way! I’ll never forget the wonder I felt the first time I cracked open our Collier’s Encyclopedia back in the 80s. There is something special about the physical discovery and exploration of information, I recall reading straight through at points just as you described! Thanks for this reminder, though my daughter isn’t yet 2 I’m constantly thinking ahead about how to handle raising her in such a digital age! Thanks, Katy. As long as you remember the joys of that physical discovery when your daughter is older, I’m sure she’ll do just fine! Love it. I used to spend ages poring over encyclopaedias, etc, to complete the Mail on Sunday general knowledge crossword (I think the prize was £1000!). Now that everyone can look up everything on the internet in just a moment, no-one needs books or general knowledge. Shame. “No one needs books or general knowledge” – that’s so true, Terry. Interesting perspective on ebook sales – perhaps you are right. I do think there’s room for both to peacefully co-exist. I recently downloaded a couple of books to my Kindle that I can’t wait to read, but boy, how I love me the printed page! So true, Colleen. It’s so easy to get sucked into the rabbit hole of online research. 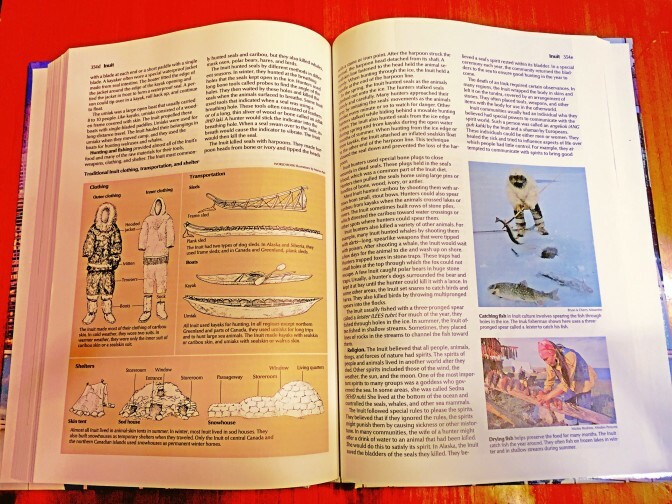 My 10yo, who started to really focus on the Inuit World Book entry last night, is amazed at how much great information it contains. She’s thrilled and so am I! We had a similar situation at home a few weeks ago when our internet went out during a storm and my son had a paper to write on plants. I went upstairs and brought down the encyclopedia volume he needed, despite his protests. He actually enjoyed it and I found him exploring more information than what he needed. Yes – those printed tomes will never let you down during a power outage – another reason to remain loyal to them! Love it. I know exactly how you feel, Heather. I think part of the reason I don’t use my Kindle as much as I used to is because I already spend too much time in front of the screen – and turning physical pages is something I started to greatly miss. Loved my set as a child. I was devastated when my mother gave them away a few years ago. She still has my atlas from the 70s, though. My daughter inherited her great-grandmother’s set of Reader’s Digest Encyclopaedia earlier this year and she loves poring over them. Ah, the atlas. We have one, too. I love it – although every time I look at it, my already severe case of wanderlust takes a turn for the worse!